To realize its objectives, the Bernadette van Gelder Foundation is dependent on gifts, legacies and donations. Since October 2017, the Foundation has the ANBI (General Benefit Organization) status, which allows for tax-friendly donations. The tax benefits then apply to both the donor and the foundation. Periodic donations offer more tax options than one-off donations. A periodic donation is a donation that you record for 5 years. To this end, you enter into an agreement with the foundation and donate an equal amount every year during this period. The entire amount is then tax- deductible for you. 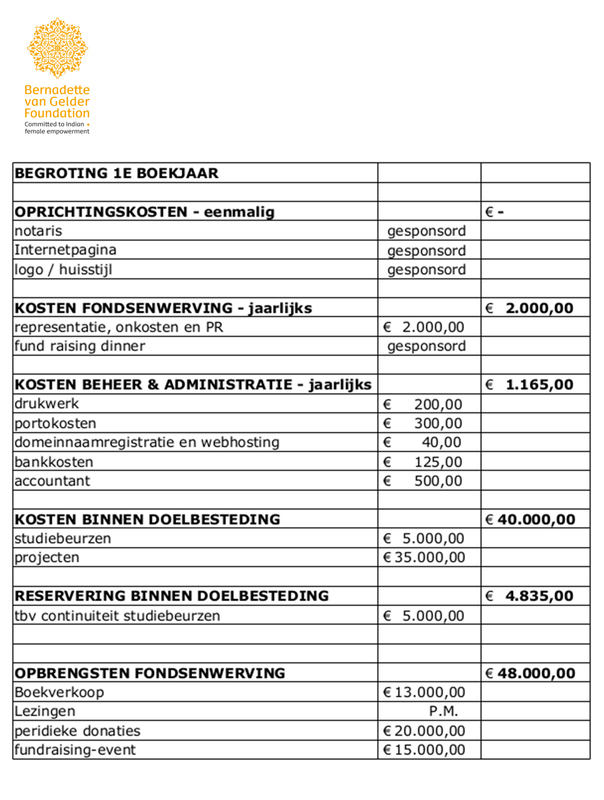 Calculation example: Set regular donations: € 120 per year Threshold: n.a. The amount of the net costs for you depends on the amount of your aggregate income. At a tax rate of 52%, your net costs amount to only € 57.60 per year for a donation of € 120, =. This is a calculation example with a randomly chosen amount. For every donation of any amount, equal tax rules apply. You see, the tax authorities make donating to the Bernadette van Gelder Foundation particularly attractive. One-off donations are deductible if the amount is above 1% and no more than 10% of your aggregate income, with a minimum of € 60. From a tax perspective, a periodic donation is more attractive. If you wish to support the Bernadette van Gelder Foundation and you want to make use of the tax- friendly donation option, please contact our Treasurer Michiel van Loon (06 - 24552282 or info@bvgfoundation.org). All board members can get a reimbursement for the costs they have reasonably incurred in exercising their duties. The board members and other persons affiliated to the Foundation do not receive a financial reward for their work. The foundation is of general utility and does not have a profit objective. The board is responsible for managing the foundation. Every driver is obliged to fulfill the duties assigned to him/her in relation to the foundation. The Foundation's assets will be administered and stored on business paying- or savings accounts at Triodos Bank. The board is only jointly authorized by these bank accounts. At least 90% of expenditures will go into the target project. Expenditures need a formal management decision. The purpose of the foundation is not explicitly to make benefits to the founders or to those who form part of the foundation's bodies. The Board is obliged to make an annual balance sheet and the statement of income and expenses of the foundation within the six following months after the end of the financial year. The Board shall draw up an annual accounts and a report as referred to in Article 2: 300 Civil Code if required by Dutch law. An accountant will supervise this. Should the foundation ever be dissolved, a possible excessive balance will be spent for a general purpose institution with a similar purpose. This is laid down in the founding statutes.